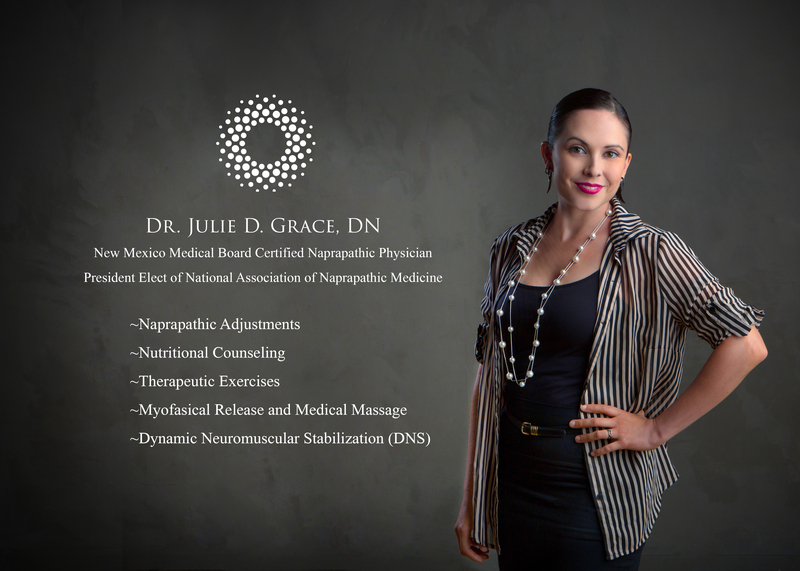 Dr. Julie Grace is a Doctor of Naprapathic Medicine certified by the New Mexico Medical Board to diagnose and treat connective tissue disorders. Dr. Grace graduated from SUNM and is currently the President Elect of The National Naprapathic Association. She believes in individualized patient-centered care. She evaluates various factors such as health history, nutritional status, lifestyle habits, and muscular strength to design specific treatment plans for each patient. Dr. Grace administers medical massage as well as naprapathic adjustments to improve posture, decrease pain, and increase quality of life. Therapeutic exercise, including DNS, and nutritional counseling are also part of her treatment plans to support the body’s natural anti-inflammatory capabilities. Dr. Grace is also an avid community advocate. She is a supporter of the local food movement and enjoys volunteering at local farms in her free time as well as organizing community wellness events.